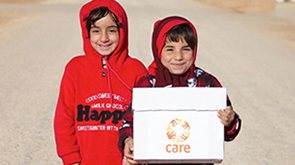 CARE believes that everyone has a right to basic education. But in many parts of the world children, particularly girls, are denied this right. In Niger, for example, only one in two girls attends primary school, just one in 10 goes to middle school, and only one in 50 goes to high school. Nearly two-thirds of the 77 million children not attending school worldwide are girls. One of those reasons is early child marriage. Every 20 seconds, a girl younger than 15 is forced to marry somewhere in the world. Child marriage robs them of their education, health, youth, and future. That’s why we work with women, girls and communities worldwide to end early child marriage. We work with individuals, communities, partner organisations and governments to address all aspects of basic education. We train teachers to improve the quality of education, link education and health programmes, and work with regional and national governments to develop and deliver innovative education programmes. For example, in Afghanistan, our accelerated learning programme helps girls who have not attended school to catch up with their peers and join age-appropriate classes as soon as possible. Investing in girls’ education creates a ripple effect: educated girls tend to delay their first pregnancies, have healthier children, earn more income for the family, and are far more likely to send their own children to school. The result: wealthier families and communities. So the empowerment of girls is truly empowering, not just for them, but for everyone. If my daughter can read and learn, she can never be taken advantage of. She will be better prepared to earn an income and help others in the community.